SYOPSIS - Ellie wakes covered in blood. She's trapped in a car on a frozen lake. CRACK. The ice is breaking. One more crack and the car will plunge into the water below, taking Ellie with it. Meet Keisha Ceylon - she's a nasty piece of work. She tricks families with visions she says will lead them to missing loved ones. However, one of those dodgy visions gets to close to the truth. Someone doesn't like it - and they're ready to kill to keep a terrible secret safe. FL Speak - I picked this up while juggling between two novels. And after 30 minutes, I finished it feeling totally exhilarated and refreshed. That's the beauty of a short novella. The tend to get over before your bums start to ache. Clouded vision starts with a murder. Ellie is stabbed and left to die over a frozen lake that is cracking under the weight of the car. Keisha Ceylon is a con artist. She uses her gift of speech into making people believe that she gets visions of the distressed and she is sent to help their loved ones. But, for a fee. So when she hears about the missing Ellie, she smells a chance to get some quick money. But her overconfident self fails to realize the clues hidden in emotions of the guilty and she ends up trying to sell her visions to the killer. The killer, who'd do anything to keep it secret, even if that meant another murder. Keisha reminded me of Patrick Jayne of the Mentalist before he turned his act around. Except that Patrick is a man. Lindwood Barclay can definitely write a tale. And that reminds me that I need to read atleast 1 of his normal novels. Its hard to write a review for a book that gets over in less than 100 pages. And this is all I can do with the plot without spelling everything out. 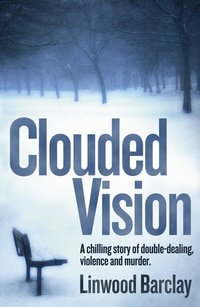 Clouded Vision is a quick read. Do not be expected to read a first rate crime novel. This novel is specifically suitable when you've nothing to do but don't want to start reading big books, when you're on a short flight, when you're on the loo smoking and know that you'll be there awhile. Almost anywhere.